Mary McIntyre was born in Northern Ireland, where she lives and works. She graduated from the University of Ulster, Belfast (MFA), where she is now a Reader in Fine Art. Her work was exhibited in The Nature of Things: Artists from Northern Ireland, Northern Ireland’s first presentation at the Venice Biennale in 2005. Exhibitions include Visual, Carlow; The MAC, Belfast; Belfast Exposed Gallery; Royal Hibernian Academy, Dublin; Helsinki Photography Biennial; The Courtauld Institute, London. Mary McIntyre was was selected for the Hennessy Art Fund for IMMA Collection 2018. McIntyre’s work ‘The Path to the Distribution Point of Light’ (2015) seeks to explore the audience’s relationship with photography. 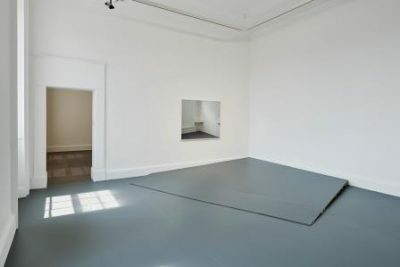 McIntyre has constructed a low platform, in the form of a vaguely disquieting shallow ramp that spills out from the corner of the gallery space. It invites greater spatial interaction with the work, which, calls into question the possibility of ‘passive’ viewing. The stage-like structure also introduces a sense of heightened theatricality, something that has always been an important aspect of McIntyre’s practice, as you are invited to walk across it to view the photograph on the wall. Each step taken towards the photographic work therefore becomes self-conscious, as your footfall is acoustically registered upon a wooden incline.